Well built. Used all winter long and is still holding up. Perfect for our family room. 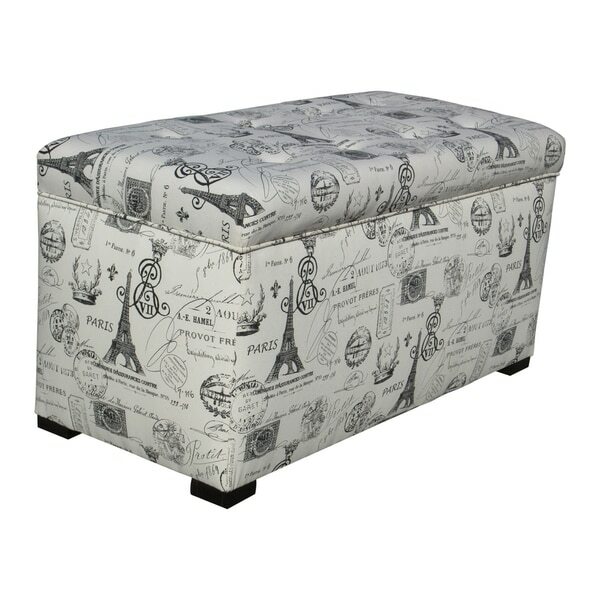 Put together a romantic chic space with this Paris storage trunk from the Angela collection by Sole Designs. An excellent storage solution to your organization needs, this stylish ottoman features a roomy storage trunk. The Parisian-themed fabric upholstery paired with button-tufted accents add to the timeless appeal of this exquisite piece. Initially I was seeking a storage trunk for the livingroom, but it was hard to find an affordable one that would fit the style of the room. Then I found this, and loving Paris like I do, had to have it! I am so so pleased with everything about this trunk. Very spacious storage area ( I have three large quilts in it, plus a blanket, two large throw pillows and a few toys and there's room left! The top is nice and cushy - comfortable to sit on - and the lid stays up when raised so no worries about small children getting hurt. The fabric covering is sturdy & attractive, it is well made. The buttons on the top are securely stitched on. I just LOVE it! (Oh, BTW, I put this trunk in my bedroom, not the livingroom) Now I'll keep looking for one for the livingroom. Ha! Thanks for another great buying experience, Overstock! Fantastic storage ottoman, better than expected!!! Can you believe my interior designer made a Roman Shade in the same Parisian fabric? Months later I came across this Storage Trunk in the same Paris theme. I am so happy! The match is beautiful; and I receive many comments on the striking shade and trunk. How fortuitous that Overstock had this trunk in its selections. Beautiful and stylish storage trunk. Lots of room to store shoes, boots, blankets and handbags. Nice padded fabric with Paris theme pattern. Love the look and feel of this transitional trunk. Accents my bedroom and adds the finishing touch. I love this storage trunk. It is stylish, durable and very functional. It keeps the clutter out of the room and it looks very chic. What a fabulous piece! Sits and fits perfectly under a window in a corner of my living room...can use it to sit and read while gazing out at the trees. Doubles as storage space (well, its primary purpose, really) and holds a surprising amount of clothing. And matches with my shabby-chic quasi-Parisian themed decor. Could not be happier nor recommend more highly! The fabric was cute and the storage space is very roomy (used for blankets and sheets). However, it is put together poorly. After one week, one of the buttons popped off. After two weeks, the fabric came undone from the bottom and was hanging down. One month later, another button came off. No one ever sat on it and it was rarely opened. I would not recommend. I love this storage trunk. I have had it for 5 years now and it still looks wonderful in my kids' Paris themed room. Perfect place for keeping bedding and pajamas. This ottoman was a great purchase it was beautiful and very well made and I swear I am able store multiple blankets in it. And I am always sitting on it so it’s very comfortable and sturdy. Definitely worth every penny I paid for it and it shipped very quick also. This is a good quality, sturdy storage bench. It's beautiful and comfortable enough to use as extra seating, and it had enough space to store a large-size moving box worth of items inside. Another plus was that it didn't have that awful chemical smell that seems to be prevalent in new furniture these days. Absolutely love this little bench! I ordered it for my daughters' bedroom to store bedding and serve as a seating area for them. Holds plenty inside, and is comfortable for my kids to sit on. My only complaint is that I wish it was more stain-resistant. My daughters spilled something that was supposed to be washable on it, and I can't seem to remove the stain! Luckily it has enough of a pattern to cover up some imperfections. Quality construction. Good heavy material, the lid is held up by solid struts, the inside is deep. Works very well in front of my love seat. Sturdy and well made! It was exactly as represented in the picture and is perfect with the rest of my furniture. Exactly what I was hoping it was. Goes perfectly in my bedroom at the end of my bed. Holds my blankets and pillows. Perfect to sit on to put my shoes on. The top closes slowly so it doesn’t slam shut. The size is perfect. I love the pattern of decor. Great storage. Sturdy. Comfortable to sit on. "Does it come with dividers for shoes or can you purchase dividers separately?" Yes, the print is black. for my daughter's dishes and extra when going out on her own. "Why does this color cost so much more than the other two colors?" Hello JRNYC, we appreciate your inquiry. We pass on great savings on to you, therefore there can be a variables in the final price. We hope this information has been helpful. Thank you for shopping with us! "What is the weight capacity of this ottoman. I would like to use it for hanging folders." Hello pyetighe1, unfortunately, Overstock has not weight tested this item. Sorry for the inconvenience. Have a great day! "Are there soft close hinges on it? Or could it slam shut?" Hello jb, this trunk does have soft close hinges on it. Thank you for shopping with us! "Does it come with removable dividers that could be used to store shoes?" Hello kindgiraffe, no, there are no removable dividers. The interior storage dimensions are listed as: 35 L X 15 H X 18 W with no interior dividers. Thank you for shopping with us.